This article covers the chronology of the 2009 novel influenza A (H1N1) pandemic. Flag icons denote the first announcements of confirmed cases by the respective nation-states, their first deaths (and other major events such as their first intergenerational cases, cases of zoonosis, and the start of national vaccination campaigns), and relevant sessions and announcements of the World Health Organization (WHO), the European Union (and its agency the European Centre for Disease Prevention and Control), and the U.S. Centers for Disease Control (CDC). Unless otherwise noted, references to terms like S-OIV, H1N1 and such, all refer to this new A(H1N1) strain and not to sundry other strains of H1N1 which are endemic in humans, birds and pigs. Take note that the date of the first confirmations of the disease or any event in a country may be before or after the date of the events in local time because of the International Dateline. Mexico In La Gloria, Veracruz 60% of the town's population is sickened by a respiratory illness of unknown provenance. The government of Mexico believes it to be caused by H3N2 influenza, though at least one patient in La Gloria tested positive for A/H1N1. Two babies died in the outbreak but both were buried without testing. United States In the ninth week of its routine influenza surveillance, the CDC reports on FluView that thirty-five states have reported widespread influenza activity, and 14 states have reported regional activity, but that although the rate of activity was high, that the proportion of deaths attributed to pneumonia and influenza (P&I) was below the epidemic threshold. United States The CDC reports on the 10th week of FluView that thirty states reported widespread influenza activity and 18 states reported regional activity. Mexico Earliest known onset of a case that is later to be confirmed as Swine-Origin Influenza A (H1N1) Virus Infection. United States CDC FluView, Week 11: Widespread influenza activity in twenty-four states; regional activity in 19. Influenza activity continues to decrease. United States Earliest known onset of a USA case later confirmed as swine flu, that of a nine-year-old girl residing in Imperial County, California. Thirteen states reported widespread influenza activity and 19 reported regional activity on the CDC's FluView, Week 12. United States A sample is collected from a nine-year-old female patient which is later confirmed to contain the novel virus strain (genetically sequenced as A/California/05/2009(H1N1)). United States Onset of illness for a ten-year-old boy residing in San Diego County, California; his case is eventually the first to be confirmed as swine flu in the US. United States A nasopharyngeal swab is collected from a ten-year-old male patient in San Diego County, later confirmed as containing the novel virus and the first organism of that strain to be completely sequenced (A/California/04/2009(H1N1)). Mexico In La Gloria, Veracruz, a four-year-old boy falls ill at the end of the outbreak. Only his sample, which was eventually sent abroad, tested positive for A(H1N1). Veracruz officials state that there were no plans to exhume the bodies of two infants who died in the outbreak. United States CDC FluView, Week 13: Widespread influenza activity in four states, regional activity in 18. European Union The media monitoring website MedISys reports on a Mexican article about the epidemiological alert. Mexico Public health authorities begin investigating unusual cases of pneumonia. 400 people had reportedly sought treatment for pneumonia/influenza-like illness (ILI) in La Gloria the preceding week. United States Biosurveillance firm Veratect reports the unusual respiratory illness in Mexico. Veratect publishes the alert "La Gloria: 'Strange' Respiratory Affects 60% of Local Population; Three Pediatric Deaths May be Associated with the Outbreak." United States CDC FluView, Week 14: Widespread influenza activity in one state; regional activity in 14. Mexico The General Directorate of Epidemiology (DGE) reports the outbreak of an ILI in a small community in Veracruz to the Pan American Health Organization (PAHO), which is the Regional Office of the World Health Organization (WHO). Furthermore, a 39-year-old woman dies of severe viral pneumonia in the city of San Luis Potosí; this is later believed to be the earliest known fatality related to the outbreak. Mexico First death in Oaxaca due to what would later be identified as swine flu. United States The U.S. Centers for Disease Control (CDC) is advised of a ten-year-old boy with a respiratory illness in San Diego County, California. Test results revealed an Influenza A virus but were negative for standard human strains. The San Diego County Health Department is notified. United States The CDC receives its first sample from California (from the ten-year-old boy in San Diego County), and identifies the virus as a strain of swine influenza A(H1N1). Mexico Authorities notify the PAHO of the atypical pneumonia. United States Veratect publishes the alert "Atypical Pneumonia Cases Reported at Hospital" regarding the Oaxaca cases. Mexico A case of atypical pneumonia in Oaxaca prompts enhanced national surveillance. A field investigation is started. Mexico contacts Canada to request more specialized testing. United States The CDC receives a second sample from Southern California (taken from the nine-year-old girl in Imperial County), and again identifies the virus as a strain of swine influenza A(H1N1). The California Department of Public Health is notified. Mexico Mexico sends 14 mucus samples to the CDC and dispatches health teams hospitals to look for patients showing severe influenza- or pneumonia-like symptoms. United States CDC FluView, Week 15: "Nine states reported regional activity; 17 states reported local influenza activity; the District of Columbia and 22 states reported sporadic influenza activity; and two states reported no influenza activity. Seven human infections with swine influenza A (H1N1) virus have been confirmed." This is the first mention of A(H1N1) in FluView. United States Veratect advises the CDC of the Mexican events. The CDC is already investigating the California and Texas cases. United States The CDC alerts physicians to a similar novel strain of swine influenza A(H1N1) in two cases from Southern California in a Morbidity and Mortality Weekly Report Early Release on its website. Local investigations, including investigations in Texas, are already underway, and overall surveillance is enhanced. The Associated Press covers the alert, the first mention of the A(H1N1) outbreak in English-language news media. Canada Canada receives the samples from Mexico for testing. Mexico The Public Health Agency of Canada confirms Mexico cases of swine-origin influenza A (H1N1) virus (S-OIV) infection. Genetic sequence analysis reveals that the Mexican patients were infected with the same S-OIV strain detected in two California children. The PAHO is informed that a cluster in Mexico of severe respiratory illnesses has been laboratory-confirmed as S-OIV infection. The WHO issues its first Disease Outbreak Notice on the matter, confirming the infection of a number of people in Mexico and the United States by "Swine Influenza A/H1N1 viruses... not... previously detected in pigs or humans". Mexico The Minister of Health confirms the Mexican cases of human infection by swine influenza and states that it believes that some of these cases had resulted in death. Health authorities implement public health measures for all airport passengers and the vaccination of health care workers with seasonal influenza vaccine. President Obama is briefed in the Situation Room about the H1N1 outbreak. United States The CDC tells a press conference that seven of the 14 Mexican samples contained the same virus strain as the known in California and Texas, and that indications suggested that containment in the USA was "not very likely". The novel strain had already been reported on the CDC's Morbidity and Mortality Weekly Report website. WHO Under the International Health Regulations (IHR), the Emergency Committee convenes for the first time since its establishment in 2007, resulting in the WHO Director-General declaring a formal "public health emergency of international concern," (PHEIC), the first ever. The PAHO Vaccination Week In The Americas starts. The 2009 Week was planned to emphasize the vaccination of entire families, and health worker immunization. United States First closure of an entire school district, the Schertz-Cibolo-Universal City Independent School District outside San Antonio, Texas. WHO The Emergency Committee meets for the second time. The WHO Director-General issues a statement that containment of the outbreak is not feasible, and elevates the pandemic alert from Phase 3 to Phase 4. European Union (EU) Health Commissioner advises Europeans not to travel to the United States or Mexico unless the need is urgent. This follows the first confirmed case in Spain. Canada First six cases confirmed, four in Nova Scotia and two in British Columbia. Spain First confirmed case of swine flu, in Almansa, and thus the first case in Europe; A(H1N1) has spread from the WHO Region of the Americas to the WHO European Region. ( ) United Kingdom First two confirmed cases, in Scotland. WHO Confirmed cases are now extant in four of six WHO regions (see map). As of 19:15 GMT seven countries have officially reported cases of swine influenza A(H1N1) infection. Canada Confirmed: two cases and another four in Alberta and Ontario, respectively. Israel First confirmed case in Israel and thus the WHO Eastern Mediterranean Region (color-coded yellow), the third region to be affected. New Zealand First three confirmed cases in New Zealand and thus the WHO Western Pacific Region (color-coded red), the fourth region to be affected. Spain The second confirmed case in Spain, in Valencia. WHO The Emergency Committee meets for the third time, and the WHO raises its pandemic alert level from Phase 4 to Phase 5, its second highest. As of 1800 GMT, nine countries have officially reported 148 cases of swine influenza A(H1N1) infection. ASEAN ASEAN officials are looking at coordinating measures to address the potential pandemic. EU Foreign Relations Commissioner Benita Ferrero-Waldner announces that the halt of all travel to Mexico and disinfecting all airports due to the global flu outbreak is being considered. Germany First three confirmed cases, two in Bavaria and one in Hamburg. Spain Eight more cases raises the total in Spain to 10, including the first human-to-human intergenerational transmission (in which the patient had not recently been to Mexico but was infected by another patient who had just visited Mexico, namely his girlfriend). This is the first intergenerational transmission to be documented in Europe. United States First death outside Mexico, a 23-month-old Mexican child hospitalized in Texas. Ninety-one confirmed cases in the US to date. South Africa First two cases reported within South Africa, by two women that travelled in Mexico weeks earlier. The cases were confirmed on 18 June 2009. Canada Confirmed: One more case in Toronto, and eight more cases in Nova Scotia, and Alberta bringing total to 28. Netherlands First confirmed case, a three-year-old child. The child returned from Mexico to the Netherlands on April 27, 2009. The parents test negative for A(H1N1). United States Four cases are confirmed in an outbreak at the University of Delaware; another 12 cases are deemed "probable". One of the confirmed cases is a baseball player, which results in the university cancelling sporting events, a concert by rapper Young Jeezy, and other school activities. United Kingdom Three further confirmed cases of swine flu, giving a total of eight confirmed cases. WHO As of 0600 GMT, 11 countries have officially reported 331 cases of influenza A(H1N1) infection. 300 people are placed under quarantine at a hotel for seven days due to Hong Kong's first confirmed case there. Chief Executive Donald Tsang raises Hong Kong's response level from "serious" to "emergency". The Director of Health, Dr. PY Lam, orders Metropark Hotel in Wan Chai to be isolated for seven days. Denmark First confirmed case (in Hvidovre). France First two confirmed cases. Mexico begins an unprecedented five-day shutdown to fight the spread of the flu. United Kingdom First and second case of human to human (or intergenerational) transmission within the UK confirmed. United States 155 confirmed cases, including two at George Washington University's Thurston Hall. WHO As of 0600 GMT 15 countries have officially reported 615 cases of influenza A(H1N1) infection. Canada The Canadian Food Inspection Agency confirms the first human-to-animal transmission of the virus after an Albertan returns from Mexico and infects a pig farm, the first known case of (reverse) zoonosis. China suspends flights from Mexico to Shanghai when a case is confirmed on a flight from Mexico. South Korea First confirmed case. United States There are more than 430 school closures in 18 states. CDC FluView Week 17: Widespread activity in seven states, regional activity in 12.
WHO As of 0600 GMT, 17 countries have officially reported 787 cases of (A)H1N1. Arab League Health Ministers meet in Riyadh, to discuss human and technical support to be deployed in any Arab affected place. Canada 101 confirmed cases after seven cases in British Columbia, three in Alberta, two in Nova Scotia and Ontario, and one in Quebec were confirmed. Colombia First confirmed case in South America. WHO As of 06:00 GMT, 20 countries have officially reported 985 cases of influenza A (H1N1) infection. Canada A girl from Edmonton, Alberta was diagnosed with a severe case of the H1N1 virus. WHO As of 06:00 GMT, 21 countries have officially reported 1,124 cases of influenza A (H1N1) infection. Second confirmed death, the first of a U.S. resident, a pregnant special education teacher in Texas: Judy Trunnell. The 33-year-old gives birth to her second child via Caesarian section during her eighth month of pregnancy, in a coma whilst on life support. Judy Trunnell had several underlying medical conditions, most notably asthma. Several sailors in San Diego, California fall ill (including a sailor on the USS Dubuque, which results in the cancellation of its deployment). These are the first cases in the U.S. Navy. As the low level of virulence of novel A(H1N1) in the U.S. becomes established, the CDC issues revised criteria for school closures, effectively ending widespread shutdowns. WHO As of 06:00 GMT, 22 countries have officially reported 1,516 cases of influenza A (H1N1) infection. ASEAN A special regional summit to fight possible swine flu pandemic was held in Bangkok and was attended by senior ASEAN health officials along with those from China, Japan and South Korea. Guatemala First confirmed case, and the first in Central America. WHO As of 18:00 GMT, 24 countries have officially reported 2,371 cases of influenza A (H1N1) infection. Brazil First four confirmed cases. Canada Reports suggest that an elderly woman who had swine flu has died in northern Alberta, marking the first death in Canada related to swine flu. Furthermore, an unusual case of zoonosis occurred when a swine flu inspector in improper gear caught the virus from an infected pig. The Netherlands Second case confirmed, a 53-year-old woman who had recently travelled to Mexico. USA The New England Journal of Medicine establishes its H1N1 Influenza Center on its website. WHO As of 16:00 GMT, 25 countries have officially reported 2,500 cases of influenza A (H1N1) infection. Japan First three confirmed cases. WHO As of 06:00 GMT, 29 countries have officially reported 3,440 cases of influenza A(H1N1) infection. Brazil Two cases confirmed, one of which is thought to be the first case of human-to-human infection in Brazil. Costa Rica First confirmed death, and also the first death outside of North America. Three other confirmed cases, all children, were contaminated by the patient who died. Japan 4th confirmed case, a schoolmate of the first three cases. Norway First two confirmed cases. United States Third confirmed death, a Washington man with underlying heart disease. Also, the USA passes Mexico in the number of confirmed cases of infection, 1693 to 1364, thus becoming the nation-state with the most laboratory-confirmed cases of infection; Canada is third with 242 cases. CDC FluView Week 18: Widespread influenza activity in eight states, regional activity in 14.
WHO As of 07:30 GMT, 29 countries have officially reported 4,379 cases of influenza A(H1N1) infection. WHO As of 06:00 GMT, 30 countries have officially reported 4,694 cases of influenza A(H1N1) infection. WHO As of 06:00 GMT, 30 countries have officially reported 5,251 cases of influenza A(H1N1) infection. Canada The first case in Yukon Territory is confirmed. Spain 100 cases confirmed. WHO As of 06:00 GMT, 13 May 2009, 33 countries have officially reported 5,728 cases of influenza A(H1N1) infection. Panama 10 more cases confirmed today. Total :39.
WHO As of 06:00 GMT, 33 countries have officially reported 6,497 cases of influenza A(H1N1) infection. Colombia First domestic infections with three cases confirmed. Total: 10.
WHO As of 06:00 GMT, 34 countries have officially reported 7,520 cases of influenza A(H1N1) infection. USA Fourth and fifth deaths confirmed, that of an Arizona woman suffering from a lung condition and a Texas man in Corpus Christi, respectively. Malaysia First confirmed case. Malaysia is the 37th country to be affected by the virus. Panama Four new cases confirmed today. Total: 43, 23 of whom are male and 20 of whom are female. 20 of the cases are under 15 years old. WHO As of 06:00 GMT 36 countries have officially reported 8,451 cases of influenza A(H1N1) infection. India First case confirmed, in Hyderabad. This marks the arrival of A(H1N1) in the fifth of the WHO's six regions, the South-East Asia Region. Japan First domestic infection confirmed, in Kobe, a male high school student with no history of travel abroad. The Kobe Festival, planned for May 16 and 17, is cancelled. Malaysia Second confirmed case. The first patient is now showing significant improvement from the treatment. Panama 11 new confirmed cases. 54 total. Turkey First confirmed case, that of an American tourist flying from the United States via Amsterdam, discovered at Istanbul's Atatürk International Airport. United States CDC FluView Week 19: Widespread influenza activity in five states, regional activity in 13.
WHO As of 06:00 GMT 37 countries have officially reported 8,480 cases of influenza A(H1N1) infection. Panama With 54 confirmed cases, Panama occupies second place, along with Canada, for the number of cases per country. WHO As of 06:00 GMT, 40 countries have officially reported 8,829 cases of influenza A(H1N1) infection, including 74 deaths. ECDC The European Centre for Disease Control releases its early findings on H1N1's pandemic potential. Japan reports 96 confirmed cases; it now ranks fourth in the world in the number of infections. Thousands of schools in 21 cities in the Hyogo and Osaka prefectures are temporarily closed. USA The sixth death in the US, and the first in New York—that of an assistant principal. WHO As of 06:00 GMT, 40 countries have officially reported 9,830 cases of influenza A(H1N1) infection, including 79 deaths. United States Seventh confirmed death, that of a 44-year-old Missouri man. Japan 191 confirmed cases; Hyogo Prefecture has the most at 111. Norway One more case confirmed today. Total: three. Paraguay confirmed its first case and became the 43rd affected country. Taiwan confirmed its first case and becomes the 44th affected country. WHO As of 06:00 GMT, 40 countries have officially reported 10,243 cases of influenza A(H1N1) infection, including 80 deaths. United States A patient dies in Arizona, and a 22-year-old man dies in Utah, the nation's eighth and ninth H1N1 fatalities. Roughly half of the influenza viruses detected by the CDC's routine influenza surveillance systems are now that of novel A(H1N1). An unusual number of outbreaks in schools is reported. Japan 236 confirmed cases, including the first case in Shiga Prefecture, and the cities of Hachiōji and Kawasaki in the Greater Tokyo Area. Two female high school students from Tokyo who had recently attended a Model United Nations conference in New York are presumed to have become infected abroad. Norway 1 more case confirmed today. Total: 4.
WHO As of 06:00 GMT, 41 countries have officially reported 11,034 cases of influenza A(H1N1) infection, including 85 deaths. Japan 279 confirmed cases; more than 4,800 schools are closed in the Kobe region. WHO As of 06:00 GMT, 42 countries have officially reported 11,168 cases of influenza A(H1N1) infection, including 86 deaths. Japan 317 confirmed, including first confirmed in Saitama Prefecture. Third confirmed in Tokyo, a 25-year-old man who visited Osaka from May 14-20th. Philippines First case confirmed. WHO As of 06:00 GMT, 43 countries have officially reported 12,022 cases of influenza A(H1N1) infection, including 86 deaths. Iceland First confirmed case. 4 more cases suspected. United States CDC FluView Week 20: Widespread influenza activity in four states; regional activity in 11. Australia Two more confirmed cases, which now brings the national toll to 16. Kuwait First confirmed cases, that of 18 U.S. soldiers. WHO As of 06:00 GMT, 46 countries have officially reported 12,515 cases of influenza A(H1N1) infection, including 91 deaths. WHO As of 06:00 GMT, 46 countries have officially reported 12,954 cases of influenza A(H1N1) infection, including 92 deaths. Puerto Rico First confirmed case. Dominican Republic First two confirmed cases. Greece confirmed two more cases. Romania First confirmed case. Singapore First confirmed case. A 22-year-old woman picked up the virus after visiting New York. Uruguay confirmed its first two cases. Singapore Three more cases confirmed. Total confirmed cases now stands at four. Bolivia First 2 cases confirmed. Greece Another one case confirmed. Total 4. United States CDC FluView Week 21: Widespread influenza activity in five states, regional activity in 10. Dominican Republic Nine more cases confirmed, for a total of 11 cases nationwide. WHO As of 06:00 GMT, 62 countries have officially reported 17,410 cases of influenza A(H1N1) infection, including 115 deaths. WHO As of 06:00 GMT, 3 June 2009, 66 countries have officially reported 19,273 cases of influenza A(H1N1) infection, including 117 deaths. Saudi Arabia First confirmed case. Trinidad and Tobago First confirmed case. WHO As of 06:00 GMT, 69 countries have officially reported 21,940 cases of influenza A(H1N1) infection, including 125 deaths. Cayman Islands First case confirmed. Dominican Republic First fatality, a 17-year-old pregnant girl. Total amount of confirmed cases rises to 44. United States CDC FluView Week 22: Widespread influenza activity in eight states, regional activity in nine. "Approximately 89% of all influenza viruses being reported to CDC were novel influenza A (H1N1) viruses." WHO As of 06:00 GMT, 73 countries have officially reported 25,288 cases of influenza A(H1N1) infection, including 139 deaths. WHO As of 06:00 GMT, 74 countries have officially reported 27,737 cases of influenza A(H1N1) infection, including 141 deaths. French Polynesia First confirmed case in the islands. The WHO raises its Pandemic Alert Level to Phase 6, citing significant transmission of the virus. Australia 1263 cases nationally, with more than 1000 cases in the State of Victoria alone. British Virgin Islands First case confirmed in the islands. Cuba Sixth case on the island, and that of the first citizen. Palestinian Territories First case confirmed in the West Bank. WHO As of 07:00 GMT, 12 June 2009, 74 countries have officially reported 29,669 cases of Influenza A (H1N1) infections, including 145 deaths. Isle of Man First case confirmed. United States Widespread influenza activity in eleven states, regional activity in six. "Over 98% of all subtyped influenza A viruses being reported to CDC were pandemic influenza A (H1N1) viruses." United Kingdom First death confirmed. Sri Lanka First confirmed case. Antigua and Barbuda First confirmed case. Ethiopia First two cases confirmed. Philippines First death in Asia confirmed. H1N1 deaths now confirmed in 3 of 6 WHO regions. Iraq First seven cases confirmed. Japan 52 more cases confirmed. Total: 944. United States CDC FluView Week 24: Widespread influenza activity in twelve states, regional activity in seven. "Over 99% of all subtyped influenza A viruses being reported to CDC were pandemic influenza A (H1N1) viruses." United States CDC FluView Week 25: Widespread influenza activity in ten states, regional in 11 states. Bosnia and Herzegovina First case confirmed. Denmark First case of Oseltamivir (Tamiflu) resistance found. Confirmed by David Reddy, Roche's pandemic taskforce leader. Nepal First three confirmed cases. South Africa South Africa National Health Department confirm community outbreak, with 7 new confirmed cases. The total of confirmed cases grew to 12640 within South Africa over the next few month. Japan Second case found with mutation resulting in Oseltamivir (Tamiflu) resistance. United States CDC FluView Week 26: Widespread influenza activity in nine states, regional influenza activity in 12. "Over 97% of all subtyped influenza A viruses being reported to CDC were novel influenza A (H1N1) viruses." Peru First two deaths confirmed. WHO 429 deaths worldwide are reported. Belize First five cases confirmed. United States CDC FluView Week 27: Widespread influenza activity in nine states, regional activity in 12. "Over 99% of all subtyped influenza A viruses being reported to CDC were novel influenza A (H1N1) viruses." Malaysia 39 more cases confirmed. Total: 710. United Kingdom Another 2 deaths confirmed. Total Deaths: 17. Brazil One more death confirmed. Total Deaths: 3. Ecuador Third death confirmed. Total deaths: 3. New Zealand Two more deaths confirmed. Total deaths 9. Total confirmed cases: 1,984. Singapore First flu-related death confirmed, that of a 49-year-old man with heart problems. Sudan First two confirmed cases of H1N1 detected, from flights which had arrived from the U.K.
Hawaii First death, that of a sexagenarian with underlying health problems. United States CDC FluView Week 28: Widespread influenza activity in seven states, regional activity in 13. "Over 99% of all subtyped influenza A viruses being reported to CDC were novel influenza A (H1N1) viruses." Venezuela First death confirmed, that of an 11-year-old girl. Singapore First death with H1N1 involvement confirmed, that of a 49-year-old male who also suffered from diabetes, hypertension and high cholesterol, from a heart attack caused by severe pneumonia. Namibia First two H1N1 cases confirmed. Canada The fourth case of mutation in the world from Tamiflu has been found in a 60-year-old man from Quebec, Canada. Federated States of Micronesia First case confirmed, that of a 27-year-old male. Northern Mariana Islands First two cases of H1N1 confirmed. Hungary First death confirmed, that of a man with underlying heart and lung disease. The WHO ceases the tracking of cumulative individual cases. Arab League Health Ministers hold a summit after the death of a pilgrim who had returned from the Hajj. New regulations were promulgated for the Hajj: anyone younger than 12 or older than 65 or who have "chronic health problems" shall not be allowed to undertake the pilgrimage to Mecca. Malaysia First flu-related death confirmed, that of an obese 30-year-old male. Canada Nova Scotia reports its first H1N1 death. Cayman Islands First death reported, that of a man with underlying medical conditions. Indonesia First H1N1 death confirmed, that of a 6-year-old girl suffering from severe pneumonia. United States It is reported that thousands of Americans are being recruited for H1N1 vaccine testing at several research centers across the country. CDC FluView Week 29: Widespread influenza activity in four states, regional activity in eight. "Over 98% of all subtyped influenza A viruses being reported to CDC were novel influenza A (H1N1) viruses." Norway An international 4H youth camp with 1,700 participants from fifteen nations is shut down after fifty Norwegian participants catch H1N1. United Kingdom Health Secretary Andy Burnham admitted that the NHS was close to the breaking point. He revealed hospitals were failing to cope as the number of suspected cases raced out of control in the UK. In another development, it emerged that football and music fans will be booted out of live events at the likes of Wembley and the O2 Arena if they show any signs of A(H1N1). WHO 816 deaths worldwide are reported. Germany Germany's federal infectious disease center, the Robert Koch Institute, states there were 3,810 confirmed cases of H1N1 in the country; nearly all of the cases are mild. Israel First death confirmed, that of a 35-year-old man from Eilat. Saint Kitts and Nevis First death reported, that of a 28-year-old woman. Saudi Arabia First death confirmed. Japan Third case of Oseltamivir (Tamiflu) resistance. Thailand In the first reported case of vertical transmission of A(H1N1), a baby is born infected. United Kingdom The NHS is not ready for a second wave of swine flu cases expected this autumn, a House of Lords committee has stated. It warned hospitals do not have enough intensive care beds to cope, and furthermore predicted that the recently established A(H1N1) flu helpline could be overwhelmed with calls. United States The U.S. military wants to establish regional teams of military personnel to assist civilian authorities in the event of a significant outbreak of the H1N1 virus this fall, according to Defense Department officials. Azerbaijan First two cases of A(H1N1) confirmed, those of people who had been on holiday in France and the U.K., respectively. Belgium First death confirmed, that of a 34-year-old woman. France First death confirmed, a 14-year-old girl in Brest. Lebanon First death confirmed, that of a 30-year-old male. Saudi Arabia Second H1N1 death confirmed, that a 28-year-old Indonesian woman. Taiwan First death confirmed, that of a 39-year-old man. WHO 1,154 deaths worldwide are reported. France The cruise ship Voyager of the Seas, which had reported dozens of cases of H1N1 flu amongst its 5,000 passengers and crew, docks in France. Australia First case of reverse zoonosis confirmed in a piggery in Dunedoo. United States CDC FluView Week 30: Widespread influenza activity in four states, regional activity in 11. "Over 98% of all subtyped influenza A viruses being reported to CDC were novel influenza A (H1N1) viruses." South Africa First confirmed death in South Africa. Total number of deaths at end of epidemic 93. Netherlands First death confirmed, that of a 17-year-old male. Solomon Islands First case confirmed. WHO 1,462 deaths worldwide are reported. United States CDC FluView Week 31: Widespread influenza activity in four states, regional activity in 10. Costa Rica President Óscar Arias is confirmed to have swine flu, the first head of state known to have been infected. WHO 1,799 deaths worldwide are reported. Turkish H1N1 control sheet, here on a German passport, issued in mid-August. Democratic Republic of the Congo First H1N1 case confirmed. United States CDC FluView Week 32: Widespread influenza activity in two states, regional activity in eight. Malaysia Two more deaths confirmed. Total: 64 deaths. Malaysia Three more deaths confirmed. Total: 67 deaths. Belarus First H1N1 case confirmed. Malaysia One more death confirmed. Total: 68 deaths. The unusually high reported death rate, four times the global average, is investigated by the WHO. Netherlands Second death confirmed, that of a 58-year-old male. Chile H1N1 is found in turkeys on farms in Chile near the port city of Valparaiso in a unique zoonosis cluster. Germany 13,740 A(H1N1) cases confirmed. United Arab Emirates First death confirmed. United Kingdom First death confirmed in Northern Ireland, that of woman with underlying health conditions. New Caledonia First death confirmed. United States CDC FluView Week 33: Widespread influenza activity in two states, regional activity in 13. Activity appears to be increasing in the Southeast. WHO At least 2,185 deaths worldwide are reported. Germany 14,325 H1N1 cases confirmed. Kyrgyzstan First two cases confirmed, that of a husband and wife; the man had recently traveled to Dubai. Malaysia One more death confirmed. Total: 69 deaths. Malaysia One more death confirmed. Total: 70 deaths. Germany 14,940 H1N1 cases confirmed. Malaysia One more death confirmed. Total: 71 deaths. UN;Chile The United Nations issues a warning regarding the discovery of H1N1-infected turkeys on farms in Chile, an unusual case of zoonosis which raises concerns about possible increased genetic reassortment of the virus. WHO Most countries in the Southern Hemisphere (represented by Chile, Argentina, New Zealand, and Australia) appear to have passed their peak of influenza activity and returned to baseline activity. ECDC Based partially on data from the Southern Hemisphere, the ECDC forecasts a first wave of infections in autumn and winter which stresses hospitals in particular; it is noted, however, that "the overall interruption of essential services in (well-prepared) countries has been manageable". Germany 15,567 H1N1 cases confirmed. Brazil 602 H1N1 deaths confirmed, the highest number of any nation-state to date. United States CDC FluView Week 34: Influenza activity, which had been largely stable or decreasing in prior weeks, increases in the U.S. "Six states and Puerto Rico reported geographically widespread influenza activity, 13 states reported regional influenza activity, 10 states and the District of Columbia reported local influenza activity, 19 states reported sporadic influenza activity, two states reported no influenza activity, and Guam and the U.S. Virgin Islands did not report." Furthermore, Region IV, i.e. the Southeast, reports increased out-patient ILI above its regional baseline. WHO At least 2,837 deaths worldwide are reported. Colombia President Álvaro Uribe is confirmed to have swine flu, the second Head of state known to have been infected. Djibouti First seven cases confirmed. United Arab Emirates Second death confirmed, that of a thirty-year-old Pakistani expatriate who died following Caesarian section. Argentina The most H1N1 deaths per capita. Bahrain First death confirmed, a South East Asian woman in her thirties with underyling medical conditions. Malaysia One more death confirmed. Total: 73 deaths. United States The CDC in its Morbidity and Mortality Weekly Report notes that 67% of thirty-six children who have died from H1N1 early in the epidemic had at least one serious chronic medical condition, with neurodevelopmental conditions such as developmental delay, epilepsy, and cerebral palsy being especially prominent. Roughly one in thirteen deaths have been of school-age children. More than 80% of the children who died were five or older, in contrast with the seasonal flu baseline of half or more of the influenza fatalities being four or younger. United States CDC FluView Week 35: Influenza increases in the U.S. with widespread influenza activity in 11 states and regional activity in 13; the proportion of outpatient visits for influenza-like illness (ILI) is above the national baseline, with four out of ten HHS Surveillance Regions reporting ILI above region-specific baselines. "97% of all subtyped influenza A viruses being reported to CDC were 2009 influenza A (H1N1) viruses." WHO At least 3,205 deaths worldwide are reported. Ecuador Ecuador's chief of presidential security, Col. John Merino, dies of H1N1 flu after twenty-eight days at Quito Military Hospital. Faroe Islands First 44 cases confirmed. Namibia First death confirmed, that of a 37-year-old businessman who had fallen ill in Angola. USA An outbreak is confirmed at the gaming convention PAX in Seattle, Washington. Australia First case of Oseltamivir (Tamiflu) resistance found. United States CDC FluView Week 36: Influenza activity continues to increase with widespread influenza activity in twenty-one states, regional influenza activity in nine. Seven of ten HHS Surveillance Regions report ILI activity above region-specific baselines. "99% of all subtyped influenza A viruses being reported to CDC were 2009 influenza A (H1N1) viruses." WHO At least 3,486 deaths worldwide are reported. Mozambique First death confirmed, that of a 29-year-old female with an unspecified chronic illness. Netherlands The third and fourth deaths are confirmed, that of a 52-year-old man and an 85-year-old woman, respectively, both of whom had underlying medical conditions. United Kingdom Health Minister Andy Burnham states that the second peak of swine flu has started as 5,000 people contracted the virus this week, compared to 3,000 the week before. Martinique First death confirmed, that of an 18-month-old girl. Malaysia One more death confirmed. Total: 77 deaths. United States CDC FluView Week 37: Widespread influenza activity in twenty-six states, regional activity in 11. All of the HHS ILI regions report elevated levels of influenza activity above their region-specific baselines except for Region I (New England). WHO Over 3,917 deaths worldwide are reported. China A national vaccination campaign begins in China, making it the first country to issue the H1N1 vaccine. United States The U.S. government orders a total of 251 million doses of H1N1 vaccine from manufacturers, up from the long-planned total of 195 million. Portugal The first death confirmed, that of a Portuguese man living in France. Germany First death confirmed, that of a 36-year-old woman who died of a so-called superinfection which included H1N1. United States Forty-two schools are closed in eight states as the second wave of the pandemic begins in early autumn. United States CDC FluView Week 38: Widespread influenza activity in twenty-seven states, regional activity in 18.
WHO At least 4,108 deaths worldwide are reported. United States The second wave of the H1N1 pandemic begins to stress hospitals in the U.S. and prompts some school closures. Cambodia First death confirmed, in Phnom Penh. Ireland First case of reverse zoonosis in pigs. Australia Mass vaccination drive begins, the second in the world. China Sinovac Biotech Ltd., the first company worldwide to complete clinical trials for a vaccine, receives an order for an additional 3 million doses of H1N1 vaccine from the PRC government, making for a total of 6.3 million doses. United States 46 states and Washington, D.C. begin ordering what becomes by the next day a cumulative total of 1,378,200 doses of the nasal-spray Live Attenuated Influenza Vaccine (LAIV) for H1N1. United States CDC FluView Week 39: The proportion of deaths attributed to pneumonia and influenza (P&I) reaches the epidemic threshold with eight out of ten HHS ILI regions reporting region-specific ILI activity above region-specific baseline levels. Widespread influenza activity in thirty-seven states, regional activity in 11.
WHO At least 4,525 deaths worldwide are reported. United States The CDC's 2009–10 influenza season officially begins. United Nations Rich countries should make more vaccines available to poorer nations where the H1N1 virus is starting to hit, United Nations health officials said. They said increased readiness for swine flu was needed in developing countries with weaker medical systems and with large, young populations, who are most vulnerable to the disease. Some countries, such as the United States, Brazil and France, have agreed to make 10 percent of their national vaccine stockpile available to developing countries. Manufacturers have also donated about 150 million doses of vaccine. China First death confirmed, in Lhasa, Tibet. Cuba First deaths confirmed, that of three pregnant women. United States CDC FluView Week 40: The proportion of deaths attributed to pneumonia and influenza (P&I) is officially above the epidemic threshold. Moreover, for the first time all 10 HHS ILI regions reported ILI above region-specific baseline levels. Widespread influenza activity in forty-one states, and regional activity in eight, with only one state—Hawaii—reporting local influenza activity. WHO At least 4,735 deaths worldwide are reported. Norway first case of reverse zoonosis detected in Nord-Trøndelag. São Tomé and Príncipe First cases confirmed. Vietnam Three cases of Tamiflu resistance (which developed during hospital treatment) are confirmed. The resistant strains were apparently not transmitted, and all three patients survived. India Six more deaths confirmed. Total: 405 deaths. Trinidad and Tobago First death confirmed. United Kingdom The death toll passes 100. Total confirmed deaths: 106. The NHS confirms that second wave of swine flu has begun, with cases in Wales and Northern Ireland being especially high. The Minister of Health confirms that there were 27,000 cases in the last week in England alone, up from 14,000 the week before. The Minister of Health also announced that 415,000 H1N1 vaccinations shall take place on the week beginging 21 October, then 5,000,000 more vaccinations the week after. 20% of all hospitalized cases are now critical, up from 12% the week before. The government believes it can get 50,000,000 Britons vaccinated before Christmas. United States An initial shortfall of swine flu vaccine is predicted shortly after the proportion of deaths attributed to pneumonia and influenza goes above the epidemic threshold in some states, with flu activity widespread in 41 states. It is also announced that the number cases, hospitalizations and deaths are unprecedented for this time of year, with flu-like illnesses accounting for 6.1% of all doctor visits, itself an unusually high number. WHO At least 4,999 deaths worldwide are reported. China Second death confirmed, in the northwestern province of Qinghai. United States CDC FluView Week 41: All 10 HHS ILI regions reported ILI above region-specific baseline levels. Widespread influenza activity in forty-six states, regional activity in three. United States H1N1 is confirmed in a nasal mucus sample taken from a show hog at the Minnesota State Fair in the first case of zoonosis in the country. India Two more deaths confirmed. Total: 415 deaths. Canada H1N1-infected turkeys are confirmed in Ontario, the second such case of zoonosis reported in the world. Iceland First death confirmed. United States In a unique case of zoonosis, a pet ferret in Oregon is confirmed to be infected with H1N1. JapanTen H1N1-infected pigs are discovered in a swine herd in Osaka Prefecture, the first reported case of zoonosis in Asia. UK H1N1 vaccinations begin nationwide, with 14,000,000 high-priority people with conditions such as asthma to be vaccinated initially, then eventually up to 51,000,000 other Britons. Czech Republic First death confirmed. Iraq Fears over the H1N1 virus prompts nearly 2,500 school closures. Germany Third H1N1 death confirmed. United States President Barack Obama declares a national emergency, inasmuch as "The potential exists for the pandemic to overburden health care resources in some localities." High-risk groups line up at a defunct Kmart for the first H1N1 vaccines publicly available in Boise, Idaho. US Various public health departments across the country run out of the H1N1 vaccine due to the shortfall of 10 million doses as the national vaccination campaign gets underway in earnest; 40 million doses had initially been projected. According to the CDC's FluView Week 42, influenza activity is widespread in 48 states, with regional activity in just two: Hawaii and South Carolina. WHO At least 5,712 deaths worldwide are reported. China Another death confirmed, in the northwestern province of Xinjiang. Canada Canada's H1N1 vaccination campaign begins. Russia First two deaths confirmed, in the far eastern city of Chita. Iceland First case of reverse zoonosis detected in pigs. Portugal A ten-year-old dies 48 hours after contracting the flu. Republic of Congo First case confirmed. ECDC The European Centre for Disease Control reports a total of 302 fatal cases in Europe to date; all of the 27 EU and the four EFTA countries are reporting cases of pandemic (H1N1) 2009 influenza. United States According to the CDC's FluView Week 43, influenza activity is widespread in 48 states, with regional activity in two: Hawaii and Mississippi. Afghanistan Schools are closed for three weeks after the first H1N1 death is recorded. WHO At least 6,071 deaths worldwide are reported. US The USDA reports the first H1N1 zoonosis in commercial swine, in a herd in Indiana. Netherlands First case of Oseltamivir (Tamiflu) resistance found. United States The first case in the world of H1N1 zoonosis in a cat is confirmed, in Iowa. San Marino First case confirmed. Bulgaria A nationwide epidemic is declared. Hong Kong Reverse zoonosis is detected in two slaughtered pigs. Saudi Arabia Mass vaccinations begin. United States CDC FluView Week 44: Widespread influenza activity in forty-six state, regional activity in four. "The proportion of outpatient visits for influenza-like illness (ILI) was 6.7% which is above the national baseline of 2.3%. All 10 regions reported ILI above region-specific baseline levels." Sri Lanka First death confirmed. United Arab Emirates Mass vaccinations begin. Armenia First two cases confirmed. France Mass vaccination drive begins. WHO In its 74th update, the WHO reports early signs that the early flu season has peaked in North America, even as the pandemic intensifies across much of Europe and Central and Eastern Asia. Bulgaria Health authorities confirm more than 12 people have died from H1N1 within a week; the latest victim is a 28-year-old man who died from respiratory failure. United States CDC FluView Week 45: Widespread influenza activity in forty-three states, regional activity in seven. "The proportion of outpatient visits for influenza-like illness (ILI) was 5.5% which is above the national baseline of 2.3%. All 10 regions reported ILI above region-specific baseline levels." Bosnia & Herzegovina First death confirmed. North Korea First case confirmed. United States First feline death confirmed, in the state of Oregon. Norway A potentially significant mutation is found in specimens taken of the H1N1 virus taken from two fatalities; a third victim was seriously ill.
UK The first person-to-person transmission of Tamiflu-resistant H1N1 in the world is confirmed at the University Hospital of Wales in Cardiff. Five patients are so infected, with three apparently having been infected in hospital in a case of iatrogenic transmission. US An iatrogenic Tamiflu-resistant cluster is reported at Duke University Medical Center in North Carolina, with four severely ill cancer patients infected, the largest cluster in the U.S. More than fifty resistant cases have been reported in the world since April. US CDC FluView Week 46: Widespread influenza activity in thirty-two states, regional activity in 17. "The proportion of outpatient visits for influenza-like illness (ILI) was 4.3% which is above the national baseline of 2.3%. All 10 regions reported ILI above region-specific baseline levels. Romania First death confirmed, that of a 43-year-old man with obesity, high blood pressure, and diabetes. United States First double infection case confirmed, in a pediatrician in West Virginia. WHO H1N1 mutations have led to roughly 75 people worldwide developing Tamiflu resistance. Furthermore, the separate D222G or D225G mutation which helps the virus to reach deep into the lungs has been reported in cases both severe and mild in Norway, Ukraine, Brazil, China, Japan, Mexico and the United States. France The H1N1 mutation first detected in Norway causes two deaths in separate French cities. South Korea First double infection case confirmed, in a two-year-old girl. China Two cases in dogs are confirmed, the first instance of canine zoonosis in the world. Indonesia First case in pigs is confirmed, in southwest Sulawesi. United States CDC FluView Week 47: Widespread influenza activity, in Twenty-five states, regional influenza activity in 17. "The proportion of outpatient visits for influenza-like illness (ILI) was 3.7% which is above the national baseline of 2.3%. Eight of the 10 regions reported ILI at or above region-specific baseline levels. Regions 6 and 10 reported ILI below their region specific baselines." United States The CDC states that H1N1 may have peaked as the number of states reporting widespread influenza dropped from 43 the previous week to 32 this week. Furthermore, influenza-like illness now account for 4.3% of doctor visits, down from 8% four weeks ago (on average, influenza accounts for 2.5% of doctor visits). The proportion of deaths attributed to pneumonia and influenza continues to be higher than expected for this time of year, however. This proportion has remained elevated for eight weeks now. Finland First case of reverse zoonosis in pigs. Saudi Arabia Only five deaths and 73 cases are reported from the haj. United Kingdom First case of reverse zoonosis in pigs is discovered, in Norfolk. US CDC FluView Week 48: Widespread flu activity in 14 states, regional activity in 25. "The proportion of deaths attributed to pneumonia and influenza (P&I) was above the epidemic threshold for the tenth consecutive week. The proportion of outpatient visits for influenza-like illness (ILI) was 2.7% which is above the national baseline of 2.3%." Gaza Strip First five cases are confirmed in the blockaded Gaza Strip. US With one in six Americans infected, or 15% of the country, nearly 10,000 have died to date, including 1,100 children and 7,500 younger adults. More than 200,000 Americans had been hospitalized to date — roughly the same number who are so affected by the regular seasonal flu variant in an entire year. Furthermore, with 12 million additional doses of H1N1 vaccine being released this week, several states begin to distribute the vaccine to the general public. North Korea First deaths are confirmed, according to newsletters released by the Seoul-based aid group Good Friends. US A sophisticated Bayesian analysis of public health data from April to the end of June from New York City and Milwaukee indicates that the pandemic's symptomatic case-fatality ratio has been far lower than the previous three pandemics of 1968, 1957, and 1918, making it to date the mildest pandemic on record. Macao First mutation confirmed, in the country's first H1N1 fatality. Afghanistan The 17th H1N1 fatality is reported. Gaza The eighth fatality is reported, that of a child with underlying kidney failure, within a week of the first H1N1 case in the Gaza Strip. United States CDC FluView Week 49: Widespread influenza activity in 11 states, regional activity in twenty. "The proportion of deaths attributed to pneumonia and influenza (P&I) was above the epidemic threshold for the eleventh consecutive week... The proportion of outpatient visits for influenza-like illness (ILI) was 2.6% which is above the national baseline of 2.3%. Five of the 10 regions reported ILI at or above region-specific baseline levels." Georgia First fatality confirmed, that of a 27-year-old man. US Roughly 100 million H1N1 vaccines become widely available to the general public in pharmacies in several American states as the supply increases and restrictions to high-risk groups are lifted. Thailand First confirmed case of H1N1 in a pig, in a case of reverse zoonosis in Saraburi Province. The pig recovered. US CDC FluView Week 50: The CDC reports that levels of influenza are declining steadily, with only seven states reporting widespread influenza activity and 18 reporting regional activity; furthermore, the proportion of deaths attributed to pneumonia and influenza (P&I) is below the epidemic threshold. The CDC also notes that almost all isolates of H1N1 remain sensitive to oseltamivir. "The proportion of outpatient visits for influenza-like illness (ILI) was 2.3% which is at the national baseline of 2.3%." US First case of canine zoonosis confirmed. The 13-year-old dog from New York state was believed to have contracted the virus from his owner. US H1N1 is discovered at two North Carolina pig farms, making it the 10th state to identify the virus in animals. The swine caught the disease from infected workers and recovered after becoming moderately ill.
Argentina An Argentine study published in the New England Journal of Medicine shows that "Pediatric 2009 H1N1 influenza was associated with pediatric death rates that were 10 times the rates for seasonal influenza than in previous years," and that the elevated risk for pregnant women extends for as long as two weeks after they give birth. US CDC FluView Week 51: Influenza activity decreases slightly, although the proportion of deaths attributed to P&I remained above the epidemic threshold. "Four states reported geographically widespread influenza activity, 13 states reported regional influenza activity, the District of Columbia, Puerto Rico, and 19 states reported local influenza activity, Guam and 13 states reported sporadic influenza activity, and one state reported no influenza activity, the U.S. Virgin Islands did not report." WHO At least 12,220 deaths globally are formally confirmed. (By contrast, the WHO estimates that the seasonal flu kills from 250,000 to 300,000 people around the world each year.) Overall, the activity of the H1N1 pandemic has peaked. Nepal First death confirmed, that of a woman who suffered major organ failure. A study published in the NEJM finds that "household contacts less than 18 years of age were twice as susceptible to an acute respiratory illness as were those 19 to 50 years of age, whereas contacts older than 50 years were less susceptible". A joint US-UK study shows that children are twice as likely as adults to catch H1N1. United States CDC FluView Week 52: The proportion of deaths attributed to P&I falls below the epidemic threshold. No influenza activity is reported in Nebraska. "One state reported geographically widespread influenza activity, 12 states reported regional influenza activity, Puerto Rico, the District of Columbia, and 17 states reported local influenza activity, the U.S. Virgin Islands, Guam, 19 states reported sporadic influenza activity, and one state reported no influenza activity." United States The CDC reports that only one state —Alabama— reports widespread influenza activity. United States According to the CDC no states have reported widespread influenza activity. United States The weekly report released by the CDC states that H1N1 activity has either remained stable or decreased over the past week in nine out of the ten regions of the United States. Furthermore, the proportion of deaths attributed to pneumonia and influenza, which technically remains above the epidemic threshold, has declined over the past week. United States According to the CDC, only three states have reported regional influenza activity: Alabama, Georgia, and South Carolina. United States According to the CDC, only four states have reported regional influenza activity: Mississippi, Alabama, Georgia, and South Carolina. United States According to the CDC, five states have reported regional influenza activity: Mississippi, Alabama, Georgia, South Carolina, and Maine. United States According to the CDC, only three states have reported regional influenza activity: Mississippi, Alabama, and Georgia. United States The CDC Morbidity and Mortality Weekly Report states that inoculation rates varied, with the highest rates in New England and the lowest in the South. (E.g., roughly 39% of the population of Rhode Island is immunized vis-à-vis 13% that of Mississippi.) Among children Georgia had the lowest vaccination rate, with 21%; the state currently has the highest level of H1N1 flu activity. US According to the CDC, only three states have reported regional influenza activity: Alabama, Georgia, and South Carolina. WHO An external panel advises against winding down the pandemic alert level until experts have tracked the southern hemisphere's traditional autumn and winter flu season. Accusations of undue influence from the pharmaceutical industry were also addressed. US According to the CDC, no states have reported either widespread or regional influenza activity, and four have reported local activity: Hawaii, Alabama, Georgia, and South Carolina. WHO Director-General Dr. Margaret Chan states that "It is still premature and too early for us to say we have come to an end of the pandemic influenza worldwide. It would be prudent and appropriate... to continue to monitor the evolution of this pandemic for the next six to 12 months," i.e. possibly into 2011. She also remarked that although the United States, Britain and Canada have passed through a second wave of H1N1, outbreaks in India, Egypt and elsewhere are intensifying, and reiterates that countries remain ill-prepared for a bird flu (H5N1) pandemic. More than 200 countries have now been affected by H1N1 with almost 12,000 confirmed deaths worldwide, although the vast majority of those infected recovered without special treatment. US Only one state -Hawaii- reports local flu activity, and 28 states report no flu activity. WHO Director-General Dr. Margaret Chan states at the U.N.'s World Health Assembly that "We are just plain lucky ... This has been the case with the A/ H1N1 influenza pandemic... The virus did not mutate to a more lethal form. Cases of resistance to oseltamivir remained few and isolated. The vaccine closely matched circulating viruses and showed an excellent safety record," Chan said. "Emergency wards and intensive care units were often strained, few health systems were overwhelmed ... Schools closed, but borders remained open, and disruptions to travel and trade were far less severe than feared," she told delegates from the agency's 193 member states. "Had things gone wrong in any of these areas, we would have a very different agenda before us today," she added." US Researchers discover the mutation which had enabled the pandemic. WHO Director-General Margaret Chan officially declares the H1N1 pandemic over as countries are now seeing a mix of H1N1, H3N2, and B viruses, with some populaces displaying community-level immunity to H1N1 of 20% to 40%. Nevertheless, Angus Nicoll of the European Centre for Disease Prevention and Control urged health officials worldwide to "prepare for a new type of seasonal flu to appear in the near future that will combine elements of the pandemic A(H1N1) strain, and older A(H3N2) strain and several lesser strains". "Pandemics are unpredictable and prone to deliver surprises," Director-General Chan noted. ^ a b "CDC 2009 H1N1 Flu". cdc.gov. Centers for Disease Control and Prevention. 11 August 2010. Retrieved 20 June 2013. ^ a b Tuckman, Jo (2009-04-27). "Four-year-old could hold key in search for source of swine flu outbreak". The Guardian. London. Retrieved 2 August 2010. ^ a b c d e f g "Outbreak of Swine-Origin Influenza A (H1N1) Virus Infection --- Mexico, March--April 2009". Morbidity and Mortality Weekly Report. Centers for Disease Control and Prevention (CDC). 2009-04-30. Archived from the original on 2009-09-11. ^ "ProjectDisaster ' Blog Archive ' Mexico & H1N1". Archived from the original on 2009-09-11. ^ Brown, David (2009-04-22). "New Strain of Swine Flu Investigated: Two Children in San Diego Area Had No Contact With Pigs". The Washington Post. Archived from the original on 2009-05-01. ^ a b c d e f g "Swine influenza A (H1N1) infection in two children --- Southern California, March--April 2009". Morbidity and Mortality Weekly Report. Centers for Disease Control and Prevention (CDC). 58 (Dispatch) (1–3). 2009-04-21. Archived from the original on 2009-09-11. ^ a b "GenBank sequences from 2009 H1N1 influenza outbreak". Influenza Virus Resource. NCBI. 2009-05-01. Archived from the original on 2009-05-02. ^ "Influenza A virus (A/California/05/2009(H1N1)) segment 1 polymerase PB2 (PB2) gene, complete cds". NCBI. Retrieved 2 August 2010. ^ "Influenza A virus (A/California/04/2009(H1N1)) segment 1 polymerase PB2 (PB2) gene, complete cds". NCBI. Retrieved 2 August 2010. ^ MedISys, EC (2008-04-05). "First article on novel influenza reported by MedISys". EC. Retrieved 2 August 2010. . Archived 2009-09-10. ^ Jornada, La (2008-04-05). "Alerta epidemiológica en Perote por brote de males respiratorios". LaJornada. Retrieved 2 August 2010. ^ a b c d e f g Brown, David (2009-04-30). "Reporting Health Threats: System Set Up After SARS Epidemic Was Slow to Alert Global Authorities". The Washington Post. Archived from the original on 2009-05-01. ^ a b c d e Blumenthal, Les (2009-05-01). "Company warned officials of flu 18 days before alert was issued". McClatchy Newspapers. Retrieved 2 August 2010. ^ "Veratect the Company to First Sound Alarm on Swine Influenza Makes Data on the Spread of this Disease Public" (PDF). Corporate press release. Veratect Inc. 2009-04-27. Retrieved 2 August 2010. ^ "Outbreak of Swine-Origin Influenza A (H1N1) Virus Infection --- Mexico, March--April 2009". Archived from the original on 2009-09-11. ^ Orsi, Peter (2009-04-27). "Mexico says suspected swine flu deaths now at 149". Google News. Associated Press. Archived from the original on 2009-04-28. ^ a b "Human Swine Influenza Outbreak. Message from the Minister of Health and the Chief Public Health Officer on Human Swine Flu". Advisories. Public Health Agency of Canada. 2009-04-24. Archived from the original on 2009-05-02. ^ Stevenson, Mark (2009-04-26). "U.S., Mexico battle deadly flu outbreak". KomoNews.com. Fisher Communications, Inc. AP. Retrieved 22 July 2016. ^ a b Stobbe, Mike (2009-04-21). "Officials alert doctors after 2 California children infected with unusual swine flu". Star Tribune. Associated Press. Archived from the original on 2009-04-30. Retrieved 2010-08-02. ^ Novel Swine-Origin Influenza A (H1N1) Virus Investigation Team; Dawood, FS; Jain, S; Finelli, L; Shaw, MW; Lindstrom, S; Garten, RJ; Gubareva, LV; Xu, X (2009). "Emergence of a novel swine-origin influenza A (H1N1) virus in humans". The New England Journal of Medicine. 360 (25): 2605–15. doi:10.1056/NEJMoa0903810. PMID 19423869. ^ Brownstein JS, Freifeld CC, Madoff LC (May 2009). "Influenza A (H1N1) virus, 2009--online monitoring". The New England Journal of Medicine. 360 (21): 2156. doi:10.1056/NEJMp0904012. PMC 2922951. PMID 19423868. Archived from the original on 13 February 2010. Retrieved 2010-02-06. ^ Stobbe, Mike (2009-04-21). "Swine flu cases in Calif. worry health officials". Fox News. AP. Archived from the original on 2009-05-02. ^ "(Update 1) Influenza-Like Illness in the United States and Mexico". World Health Organization. 2009-04-24. Archived from the original on 28 June 2010. Retrieved 2 August 2010. ^ a b "CDC Briefing on Public Health Investigation of Human Cases of Swine Influenza (April 24, 2009)". Press Briefing Transcripts. Centers for Disease Control and Prevention (CDC). 2009-04-24. Retrieved 2 August 2010. ^ "Inside Justice - Swine Flu: Legal Obligations and Consequences When the World Health Organization Declares a "Public Health Emergency of International Concern"". www.insidejustice.com. ^ "Statement by WHO Director-General, Dr Margaret Chan (25 April 2009): Swine influenza". World Health Organization. 2009-04-25. Retrieved 2 August 2010. ^ "WHO | Swine flu illness in the United States and Mexico - update 2". World Health Organization. 2009-04-26. Archived from the original on 22 August 2010. Retrieved 2 August 2010. ^ "WHO - IHR Procedures concerning public health emergencies of international concern (PHEIC)". www.who.int. ^ a b "Vaccination Week In The Americas (2009 portal)". Pan American Health Organization. 2009. Archived from the original on 6 August 2010. Retrieved 2 August 2010. ^ Abramson, Larry (29 April 2009). "First Texas school district closure". NPR. Retrieved 17 June 2013. ^ "List of Texas school district closures". Texas Education Agency. 1 May 2009. Archived from the original on 2 May 2009. Retrieved 10 June 2013. ^ "Statement by WHO Director-General, Dr Margaret Chan (27 April 2009): Swine influenza". World Health Organization. 2009-04-27. Retrieved 2 August 2010. ^ Nasaw, Daniel (27 April 2009). "Europeans urged to avoid Mexico and US as swine flu death toll exceeds 100". The Guardian. London. Retrieved 2 August 2010. ^ "Health officials confirm 6 cases of swine flu in Canada". CBC News. 2009-04-27. Retrieved 2 August 2010. ^ "Swine Influenza Update 3". World Health Organization. 27 April 2009. Retrieved 2 August 2010. ^ "Scotland 'could help combat flu'". BBC News. 29 April 2009. Retrieved 2018-01-28. ^ "WHO | Swine influenza - update 4". World Health Organization. 2009-04-28. Archived from the original on 2010-08-12. Retrieved 2010-08-02. ^ Philip Ling. "Swine flu: Mapping the H1N1 outbreak in Canada". Archived from the original on 2009-09-11. ^ Xinhua (2009-04-28). "Israel confirms first case of swine flu". The Gaea Times. Retrieved 2013-12-20. ^ "RESULTS OF H1N1 (Swine flu) testing" (Press release). New Zealand Ministry of Health. 2009-04-28. Archived from the original on 2009-04-29. Retrieved 2010-08-02. ^ "Spain confirms second case of swine flu". Archived from the original on 2009-09-11. ^ "Pandemic phase level 4: Human cases of the novel influenza A/H1N1 strain confirmed in Scotland and Spain" (PDF). EUROSURVEILLANCE. European Centre for Disease Prevention and Control. 2009-04-30. Archived (PDF) from the original on 2009-05-14. Retrieved 2013-12-20. ^ Jordans, Frank; Cheng, Maria (2009-04-29). "WHO calls emergency meeting; eyes pandemic level". Google News. Associated Press. Archived from the original on 2009-04-30. ^ "Statement by WHO Director-General, Dr Margaret Chan (29 April 2009): Swine influenza". World Health Organization. 2009-04-27. Retrieved 2 August 2010. ^ a b "WHO | Influenza A(H1N1) - update 5". World Health Organization. 2009-04-29. Retrieved 2 August 2010. ^ "Swine flu: Asean gears up". Archived from the original on 2009-09-11. ^ "EU considers halting all Mexico travel". Reuters. 2009-04-29. Retrieved 2 August 2010. ^ "SWINE FLU: GERMANY CONFIRMS THREE CASES". AGI. 2009-04-29. Archived from the original on 2009-05-01. ^ "WHO looking for signs of ongoing swine flu spread". CTV.ca. 2009-04-28. Retrieved 2 August 2010. ^ "Mexico begins five-day shutdown to fight swine flu - News - Muzi.com". Dailynews.muzi.com. Retrieved 2 August 2010. ^ "U.S. H1N1 Victim Visited Texas Mall". CBS News. 2009-04-30. Retrieved 2 August 2010. ^ Scott Weese. "Updated H1N1 (swine) influenza outbreak numbers from WHO : Worms and Germs Blog". Archived from the original on 2009-09-11. ^ Talaga, Tanya (2009-04-30). "N.S. has first Canadian person-to-person flu case". The Star. Toronto. Retrieved 2 August 2010. ^ "Irish man treated for swine flu". BBC. 2009-04-30. Retrieved 2 August 2010. ^ Stevenson, Reed (2009-04-30). "Dutch confirm swine flu case in three year-old". Reuters. Retrieved 2 August 2010. ^ "Switzerland confirms first case of swine flu". Reuters. 2009-04-30. Retrieved 2 August 2010. ^ Miller, Beth; Brown, Robin; Riley, Emily (3 May 2009). "More than 350 treated at UD". delawareonline. The News Journal. Archived from the original on 3 May 2009. Retrieved 2 August 2010. ^ "WHO | Influenza A(H1N1) - update 7". World Health Organization. Archived from the original on 17 July 2010. Retrieved 2 August 2010. ^ "Asia-Pacific | Hong Kong 'flu' hotel sealed off". BBC News. 2007-04-18. Retrieved 2 August 2010. ^ "1st H1N1 case confirmed in HK". Hong Kong SAR. 2009-05-01. Archived from the original on 7 June 2009. Retrieved 2 August 2010. ^ "Director of Health issues isolation order to control human swine flu". Centre for Health Protection. 2009-05-31. Retrieved 2 August 2010. ^ Jensen, Marie Joo Kim (2008-12-16). "Dansk kvinde smittet med H1N1-influenza efter New York-rejse" [Danish woman infected with the H1N1 flu after the New York trip]. BT (in Danish). Retrieved 2013-12-20. ^ "Sujets suspects et cas de nouvelle grippe A(H1N1) en France" [Suspicious subjects and cases of new influenza A (H1N1) in France] (PDF) (in French). 2009-05-01. Archived from the original (PDF) on 2009-05-20. Retrieved 2010-08-02. ^ "Mexico To Close Down Most Businesses For Five Days As 331 Cases Of Swine Flu Reported". AHN. 2009-05-01. Retrieved 2 August 2010. ^ HPA. "First case of onward human to human swine flu transmission in England confirmed". Archived from the original on 4 May 2009. Retrieved 2 August 2010. ^ "H1N1 virus hits campus | UWIRE". Archived from the original on 2009-09-11. ^ a b "WHO | Influenza A(H1N1) - update 9". World Health Organization. Archived from the original on 17 July 2010. Retrieved 2 August 2010. ^ "Worker may have passed H1N1 to Alberta pigs". CTV. 2009-05-02. Archived from the original on 2009-05-03. Retrieved 2010-08-02. ^ "China halts Mexico flights as flu hits". Shanghai Daily. Global Times. 2009-05-03. Retrieved 2013-12-20. ^ "1st South Korea case". World Health Organization. Archived from the original on 17 July 2010. Retrieved 2 August 2010. ^ Werner, Erica (2 May 2009). "More schools shut as swine flu spreads in US". Yahoo! News. Associated Press. Archived from the original on 5 May 2009. Retrieved 10 June 2013. ^ "Arab health ministers meet on swine flu". KUNA. 2009-05-03. Retrieved 2018-01-28. ^ a b "Swine flu epidemic on decline: Mexico". CBC. 2009-05-03. Retrieved 2018-01-28. ^ "WHO | Influenza A(H1N1) — update 13". World Health Organization. Archived from the original on 17 July 2010. Retrieved 2 August 2010. ^ "New Influenza A (H1N1): Number of laboratory confirmed cases and deaths". World Health Organization. 4 May 2009. Archived from the original on 7 May 2009. Retrieved 13 June 2013. ^ "Canada identifies first severe flu case". Australia: Brisbane Times. May 5, 2009. Retrieved 2 August 2010. ^ "WHO | Influenza A(H1N1) - update 15". World Health Organization. Archived from the original on 17 July 2010. Retrieved 2 August 2010. ^ "Second U.S. death linked to swine flu, officials say". CNN Health. CNN. 2009-05-05. Retrieved 2013-12-20. ^ "Texas H1N1 victim had chronic respiratory..." Archived from the original on February 26, 2012. Retrieved May 8, 2009. ^ Mcneil Jr., Donald G. (2009-05-09). "Other Illness May Precede Worst Cases of Swine Flu". The New York Times. Retrieved 2 August 2010. ^ "Americas | US navy halts aid vessel over flu". BBC News. 2009-04-28. Retrieved 2 August 2010. ^ "WHO | Influenza A(H1N1) - update 17". World Health Organization. Archived from the original on 17 July 2010. Retrieved 2 August 2010. ^ "ASEAN swine flu summit in Bangkok". Archived from the original on 2009-09-11. ^ "H5N1: Guatemala: First case of H1N1". Archived from the original on 2009-09-11. ^ "First H1N1 flu case reported in Poland-PAP news agency". Reuters. 2009-05-06. Retrieved 2 August 2010. ^ "Sweden confirms first case of H1N1 flu". Reuters. 2009-05-06. Retrieved 2 August 2010. ^ "WHO | Influenza A(H1N1) - update 20". World Health Organization. Archived from the original on 17 July 2010. Retrieved 2 August 2010. ^ "Confirmaron el primer caso de gripe porcina en la Argentina". lanacion.com. Retrieved 2 August 2010. ^ "Stabroek News - Brazil confirms 4 cases of H1N1 flu-minister". Archived from the original on 2009-09-11. ^ "Reports suggest elderly Alberta woman with swine flu has died". cbc.ca. May 7, 2009. Archived from the original on 11 May 2009. Retrieved 2 August 2010. ^ "Swine-flu inspectors in improper gear got virus". CBC News. 20 July 2009. Archived from the original on 10 September 2009. ^ "WHO | Influenza A(H1N1) - update 22". World Health Organization. Archived from the original on 17 July 2010. Retrieved 2 August 2010. ^ "Three Japanese test positive for swine flu". AFP. May 8, 2009T. Retrieved 2 August 2010. ^ "Panama's first swine flu case confirmed". The Sydney Morning Herald. 2009-05-09. Retrieved 2 August 2010. ^ "WHO; Influenza A(H1N1) - update 23". World Health Organization. Archived from the original on 17 July 2010. Retrieved 2 August 2010. ^ "First confirmed case of swine flu in Australia". News Limited. 9 May 2009. Archived from the original on 11 May 2009. Retrieved 2 August 2010. ^ "Brasil permanece com 30 casos suspeitos da nova gripe". g1.globo.com. 2009-05-09. Retrieved 2 August 2010. ^ "Muere primer tico contagiado de gripe AH1N1" (in Spanish). La Nación. 2009-05-09. Archived from the original on May 13, 2009. Retrieved 2 August 2010. ^ "Costa Rica Sees 1st Swine Flu Death". ABC News. 2009-05-09. Retrieved 2 August 2010. ^ "Tres niños con gripe AH1N1 fueron contagiados por tico que falleció esta madrugada" (in Spanish). La Nación. 2009-05-09. Archived from the original on 13 May 2009. Retrieved 2 August 2010. ^ "Japan Confirms 4th Case Of Swine Flu". NHK. 10 May 2009. Archived from the original on 15 July 2009. Retrieved 9 June 2013. ^ "To norske studenter smittet av svineinfluensa". vg.no. 2009-05-09. Archived from the original on 17 July 2009. Retrieved 2 August 2010. ^ "WHO; Influenza A(H1N1) - update 24". World Health Organization. Archived from the original on 17 July 2010. Retrieved 2 August 2010. ^ "China Has First H1N1 (Swine Flu) Case". Archived from the original on 2009-09-11. ^ "WHO; Influenza A(H1N1) - update 25". World Health Organization. Archived from the original on 17 July 2010. Retrieved 2 August 2010. ^ "WHO; Influenza A(H1N1) - update 26". World Health Organization. Retrieved 2 August 2010. ^ "Yukon confirms 1st swine flu case". CBC. 2009-05-12. Archived from the original on 20 May 2009. Retrieved 2 August 2010. ^ "WHO; Influenza A(H1N1) - update 27". World Health Organization. Archived from the original on 17 July 2010. Retrieved 2 August 2010. ^ "WHO; Influenza A(H1N1) - update 28". World Health Organization. Archived from the original on 2010-07-17. Retrieved 2010-08-02. ^ "Tweede geval van Mexicaanse griep in België" [Second case of swine flu in Belgium]. Het Laatste Nieuws (in Dutch). Kobbegem, Belgium. 2009-05-14. Retrieved 2013-12-21. ^ "Confirman tres nuevos casos de contagiados con el virus de la nueva influenza en Colombia" [Confirmed three new cases infected with the new influenza virus in Colombia]. El Tiempo (in Spanish). Bogotá, Colombia. 2009-05-14. Retrieved 2013-12-21. ^ "WHO; Influenza A(H1N1) - update 29". World Health Organization. Archived from the original on 17 July 2010. Retrieved 2 August 2010. ^ Fox, Maggie (2009-05-15). "U.S. logs fifth H1N1 swine flu death, in Texas". Reuters. Retrieved 2 August 2010. ^ "Malaysia confirms first case of A(H1N1) flu (Update 2)". Retrieved 12 May 2013. ^ "43 Casos Confirmados" (in Spanish). Telemetro. 2009-05-15. Retrieved 2 August 2010. ^ "India confirms first case of H1N1 flu". Reuters. 2009-05-16. Retrieved 2 August 2010. ^ "First domestic case of H1NI flu infection confirmed in Japan". The Japan Times. May 16, 2009. Archived from the original on 22 July 2010. Retrieved 2 August 2010. ^ Kitano, Masayuki (May 16, 2009). "Western Japan city to close schools due to new flu". Reuters. Retrieved 2 August 2010. ^ "A (H1N1): Second confirmed case in Malaysia (Update 4)". Retrieved 12 May 2013. ^ "First case of swine flu confirmed in Turkey - health minister". Archived from the original on August 14, 2009. Retrieved May 3, 2010. ^ "WHO; Influenza A(H1N1) - update 32". World Health Organization. Archived from the original on 17 July 2010. Retrieved 2 August 2010. ^ "96 cases of new flu confirmed in Japan". NHK WORLD. 2009-05-18. Archived from the original on 20 October 2010. Retrieved 2 August 2010. ^ "Over 1,000 flu cases estimated in Japan". NHK WORLD. 2009-05-18. Archived from the original on 22 March 2011. Retrieved 2 August 2010. ^ "Government asks schools to close". NHK WORLD. 2009-05-18. Archived from the original on 21 August 2010. Retrieved 2 August 2010. ^ Yaniv, Oren; Kennedy, Helen (2009-05-18). "Assistant principal Mitchell Wiener dies from complications of swine flu". Daily News. New York. Retrieved 2 August 2010. ^ "WHO; Influenza A(H1N1) - update 33". World Health Organization. Archived from the original on 17 July 2010. Retrieved 2 August 2010. ^ "191 flu cases confirmed in Japan". NHK WORLD. 2009-05-18. Archived from the original on 22 February 2010. Retrieved 2 August 2010. ^ "WHO; Influenza A(H1N1) - update 34". World Health Organization. Archived from the original on 17 July 2010. Retrieved 2 August 2010. ^ Fox, Maggie (2009-05-20). "U.S. officials consider bumping up flu shot season". MedlinePlus. Reuters Health. Archived from the original on 2009-05-28. ^ "Utah reports first flu-related death, nation's 9th". USA Today. 2010-08-06. Archived from the original on 2009-05-23. ^ "Japan's tally of confirmed A/H1N1 cases reaches 236". 2009-05-20. Retrieved 2 August 2010. ^ "New flu infection confirmed in Tokyo and Kawasaki". 2009-05-21. Archived from the original on 23 March 2011. Retrieved 2 August 2010. ^ "WHO; Influenza A(H1N1) - update 35". World Health Organization. Archived from the original on 17 July 2010. Retrieved 2 August 2010. ^ Tabuchi, Hiroko (2009-05-22). "Spread of Swine Flu Puts Japan in Crisis Mode". The New York Times. Retrieved 2 August 2010. ^ "WHO; Influenza A(H1N1) - update 36". World Health Organization. Archived from the original on 17 July 2010. Retrieved 2 August 2010. ^ Fukue, Natsuko (2009-05-23). "Flu policy given more flexibility". The Japan Times. Japan. Retrieved 2013-12-21. ^ "H1N1 greinist á Íslandi" (in Icelandic). 23 May 2009. Archived from the original on July 19, 2011. Retrieved 2 August 2010. ^ "Two more Victorians diagnosed with swine flu". News.com.au. 2009-05-24. Retrieved 2 August 2010. ^ "Second swine flu case in Republic". BBC News. 2009-05-25. Retrieved 2 August 2010. ^ "Department of Health - The website you tried to access has been decommissioned" (PDF). www.healthemergency.gov.au. ^ "Greece confirms 3rd swine flu case". GMANews.tv. 2009-05-27. Archived from the original on 30 June 2009. Retrieved 2 August 2010. ^ "Singapore records first A (H1N1) flu case". Retrieved 12 May 2013. ^ "New flu cases bring total to 186". BBC News. 2009-05-27. Retrieved 2 August 2010. ^ "Top doctor calls for swine flu calm". The Age. Melbourne. 2009-05-29. Retrieved 2 August 2010. ^ "Further swine flu cases confirmed". BBC News. 2009-05-29. Retrieved 2 August 2010. ^ "Hungary confirms first H1N1 flu case". Reuters. 2009-05-29. Retrieved 2 August 2010. ^ "Τέταρτο κρούσμα της νέας γρίπης Α στην Ελλάδα Μία 23χρονη Ελληνίδα είναι το νέο κρούσμα της νέας γρίπης στην χώρα. Το Κέντρο Αναφοράς Γρίπης Νοτίου Ελλάδας (Ινστιτούτο Παστέρ) επιβεβαίωσε το τέταρτο κρούσμα". Kathimerini. 2009-05-29. Archived from the original on 2012-08-04. Retrieved 2 August 2010. ^ "9 more swine flu cases in Dominican Republic". MLive.com. 2009-05-31. Archived from the original on 2013-05-21. Retrieved 2 August 2010. ^ "Middle East Online". Archived from the original on 2009-09-11. ^ "Luxembourg confirms first H1N1 flu case". Reuters. 2009-06-02. Retrieved 2 August 2010. ^ "Nicaragua Registers 1st Case of A/H1N1 Flu - en.chinagate.cn". Archived from the original on 2009-09-11. ^ Andy Sambidge. "Saudi confirms first swine flu case - Healthcare - ArabianBusiness.com". Archived from the original on 2009-09-11. ^ "Barbados records first case of "swine flu"". Archived from the original on June 8, 2009. Retrieved September 1, 2009. ^ "A (H1N1) flu: M'sia reports 3 more cases". Retrieved 12 May 2013. ^ "Pregnant girl dies with AH1N1 flu". Diario Libre. 2009-06-05. Retrieved 2 August 2010. ^ "A (H1N1) flu: Malaysia confirms 7th case (Update)". Retrieved 12 May 2013. ^ "BULLETIN EPIDEMIOLOGIQUE GRIPPE A(H1N1)". Institut de veille sanitaire. 2009-06-10. Retrieved 2 August 2010. ^ "WHO declares swine flu pandemic". BBC News. 2009-06-11. Retrieved 2 August 2010. ^ "WHO declares first 21st century flu pandemic". Reuters. 2009-06-11. Retrieved 2 August 2010. ^ a b "Palestinians report first case of H1N1 flu". Reuters. 2009-06-10. Retrieved 2 August 2010. ^ "Confirman sexto paciente de gripe A en Cuba, primero que no es extranjero" (in Spanish). Retrieved 2 August 2010. ^ "First Isle of Man swine flu case". BBC News. 2009-06-12. Retrieved 2 August 2010. ^ "Sociedad - Confirman 2 primeros casos "locales" en Bolivia, que suma 7 afectados gripe A - ADN.es". Archived from the original on 2009-09-11. ^ ROYCE CHEAH. "A(H1N1): Twelfth case confirmed in Malaysia (Updated)". Archived from the original on 2009-09-11. ^ "A (H1N1): Malaysia confirms 5 more, taking total to 17 (Update)". Archived from the original on 2009-09-11. ^ "First UK swine flu patient death". BBC News. 2009-06-15. Retrieved 2 August 2010. ^ DHARMENDER SINGH. "A (H1N1): First locally-transmitted case confirmed (Update)". Archived from the original on 2009-09-11. ^ "Boy, 9, becomes first swine flu case in Antigua". Taiwan News. 2009-06-19. Archived from the original on 2009-09-11. ^ "First A/H1N1 flu case detected in Bangladesh". People's Daily. 2009-06-19. Archived from the original on 2009-09-11. ^ "Ethiopia confirms first cases of H1N1". Reuters. 2009-06-19. Archived from the original on 2009-09-11. ^ "Health news". Syracuse News. 2009-06-19. Archived from the original on 2009-09-11. ^ "Update No. 48 - Duque Reports High Risk Patient who Dies of Heart Attack Found with A(h1N1);84% if all Reported Cases have Fully Recovered". Department of Health. Archived from the original on 30 June 2009. Retrieved 2 August 2010. ^ Kami, Aseel (2009-06-24). "Iraq confirms first cases of H1N1 flu virus". Reuters. Retrieved 2 August 2010. ^ Sekularac, Ivana (2009-06-24). "Serbia confirms first case of H1N1 flu". Reuters. Retrieved 2 August 2010. ^ Novi grip stigao u BiH!. Accessed 2009-09-09. Archived July 8, 2009, at the Wayback Machine 2009-09-10. ^ "A/H1N1 Swine Flu (Influenza) Timeline | June 29 | Oseltamivir (Tamiflu) resistance found [English article]". Archived from the original on 2009-09-11. ^ "A/H1N1 Swine Flu (Influenza) Timeline | June 29 | Kenya (KE) | First case confirmed". Archived from the original on 2009-09-11. ^ "A/H1N1 Swine Flu (Influenza) Timeline | June 29 | Mauritius (MU) | First case confirmed". Archived from the original on 2009-09-11. ^ "A/H1N1 Swine Flu (Influenza) Timeline | June 29 | Nepal (NP) | First case confirmed". Archived from the original on 2009-09-11. ^ "A/H1N1 Swine Flu (Influenza) Timeline | July 1: Guam (GU): First case confirmed". Archived from the original on 2009-09-11. ^ "Health Emergency - First NSW death". Archived from the original on 2009-09-11. ^ "A/H1N1 Swine Flu (Influenza) Timeline | July 2: Japan (JP): Oseltamivir resistance found". Archived from the original on 2009-09-11. ^ "Primeiro caso de contágio interno de Gripe A". Archived from the original on 2009-09-11. ^ "A/H1N1 Swine Flu (Influenza) Timeline | July 4: Syria (SY): First case confirmed". Archived from the original on 2009-09-11. ^ "A/H1N1 Swine Flu (Influenza) Timeline | July 8: Belize (BZ): First case confirmed". Archived from the original on 2009-09-11. ^ "Principales noticias de Colombia y el mundo - ELTIEMPO.COM -> Joven de 25 años se convirtió en la sexta víctima mortal de nueva gripa en Colombia". Archived from the original on 2009-09-11. ^ Heavens, Andrew (2009-07-16). "Sudan reports first H1N1 flu case". Reuters. Retrieved 2 August 2010. ^ "Hawaii Reports First H1N1 Death". Archived from the original on July 7, 2009. Retrieved August 21, 2009. ^ "Earth Times: news/278016,singapore-reports-first-death-related-to-h1n1-influenza.html". www.earthtimes.org. ^ "A/H1N1 Swine Flu (Influenza) Timeline | July 19: Egypt (EG): First death confirmed". Archived from the original on 2009-09-11. ^ "Georgia reports its first case of H1N1 flu". Reuters. 2009-07-18. Retrieved 2 August 2010. ^ "Silobreaker: Document Not Found". Archived from the original on 2009-09-11. ^ "COM-FSM: First Case of H1N1 in FSM". Archived from the original on 2009-09-11. ^ "Guam reports its first swine flu-related death". Archived from the original on 2009-09-11. ^ "H5N1: Hungary reports first H1N1 death". Archived from the original on 2009-09-11. ^ "Tonga records flu death - Fiji Times Online". Archived from the original on 2009-09-11. ^ "BAM Intel: H1N1 Update - Vaccine Test, WHO Ceases Counting, More Tamiflu-Resistant Cases Found". Archived from the original on 2009-09-11. ^ "Indonesia reports first death from H1N1 flu". Reuters. 2009-07-26. Retrieved 2 August 2010. ^ "School: No shortage of volunteers for swine flu vaccine trials". CNN. 2009-07-26. Retrieved 2 August 2010. ^ Rolleiv Solholm. "The Norway Post - Swine flu closes youth camp". Archived from the original on 2009-09-11. ^ "Daily Star: Simply The Best 7 Days A Week :: News :: Time to panic". Archived from the original on 2009-09-11. ^ "No reason for swine flu panic in Germany, says expert | Science & Technology | Deutsche Welle | 28.07.2009". Archived from the original on 2009-09-11. ^ "Kosovo registers first case of H1N1 flu virus". Archived from the original on 2009-09-11. ^ "Tamiflu Resistance in Pandemic H1N1". Archived from the original on 2009-09-11. ^ "Thai baby born infected with swine flu". Archived from the original on 2009-09-11. ^ "NHS 'to be swamped by second wave of swine flu' - mirror.co.uk". Archived from the original on 2009-09-11. ^ "Military planning for possible H1N1 outbreak". CNN. 2009-07-29. Archived from the original on 8 August 2010. Retrieved 2 August 2010. ^ "Azerbaijan reports first two H1N1 flu cases". 2009-07-30. Retrieved 2 August 2010. ^ "A/H1N1 Swine Flu (Influenza) Timeline | July 30: France (FR): First death confirmed". Archived from the original on 2009-09-11. ^ "Pandemic Preparedness". Archived from the original on 2009-09-11. ^ "Lebanon records first H1N1 death". 2009-07-30. Retrieved 2 August 2010. ^ Karam, Souhail (2009-07-30). "Saudi Arabia reports second H1N1 flu death". Reuters. Retrieved 2 August 2010. ^ Hardach, Sophie (2009-07-31). "UPDATE 4-Cruise ship has 60 flu cases, company says no H1N1". Reuters. Retrieved 2 August 2010. ^ a b "Tweede dode Mexicaanse griep in Nederland". Archived from the original on 2009-09-27. ^ "Islands Business - Solomon Islands confirmed swine flu case". Archived from the original on 2009-09-11. ^ "Costa Rican president sick with swine flu". CNN. 2009-08-12. Archived from the original on 3 September 2010. Retrieved 2 August 2010. ^ "News - Flu Outbreak: Madagascar announces first swine flu death". Archived from the original on 2009-09-11. ^ "News - Africa: DRC: First swine flu case". Archived from the original on 2009-09-11. ^ a b "A (H1N1): 2 more die, health curfew if mortality rate reaches 0.4pc (Update 4)". TheStar Online. 2009-08-17. Archived from the original on 2009-09-11. ^ "A(H1N1): Toll rises to 67 with three more deaths". Sun2Surf. 2009-08-18. Archived from the original on 2009-09-11. ^ "Belarus registers first case of swine flu - Health Ministry | Top Russian news and analysis online | 'RIA Novosti' newswire". Archived from the original on 2009-09-11. ^ "Influenza A(H1N1) hits record high with 569 cases (Update)". TheStar Online. 2009-08-20. Archived from the original on 2009-09-10. ^ Quilodran, Federico (21 August 2009). "Swine flu jumps again — to turkeys in Chile — but scientists see no dangerous mutation yet". Star Tribune. Associated Press. Archived from the original on 28 August 2009. Retrieved 9 June 2013. ^ "RKI Influenza". Archived from the original on 2009-09-11. ^ "RTÉ News: First death in NI from swine flu". 2009-08-21. Archived from the original on 2009-09-11. ^ "Earth Times: news/282497,greece-reports-first-death-from-swine-flu.html". www.earthtimes.org. ^ "H5N1: Kyrgyzstan reports first two H1N1 cases". Archived from the original on 2009-09-11. ^ "Teacher's death due to A(H1N1); Death toll reaches 69". Sun2Surf. 2009-08-24. Archived from the original on 2009-09-11. ^ "A (H1N1): Latest victim is 3-yr-old; death toll rises to 70". TheStar Online. 2009-08-25. Archived from the original on 2009-09-11. ^ "H5N1: Angola reports first H1N1 cases". Archived from the original on 2009-09-11. ^ "Overweight young woman is H1N1 victim 71". Malaysian Insider. 2009-08-26. Archived from the original on 2009-09-11. ^ "Global Times - FAO says H1N1 flu in turkeys may spread worldwide". Archived from the original on 2009-09-11. ^ Chand, Sudeep (2009-08-27). "UN warns over swine flu in birds". BBC News. Retrieved 2 August 2010. ^ "A/H1N1 Swine Flu (Influenza) Timeline | August 29: Brazil (BR): 602 deaths confirmed". Archived from the original on 2009-09-11. ^ Bronstein, Hugh (2009-08-31). "Colombia says president has swine flu". Reuters. Retrieved 2 August 2010. ^ a b "Home Page - Gulf in the Media". Archived from the original on 2009-09-11. ^ "Sweden's first swine flu death confirmed - The Local". Archived from the original on 2009-09-11. ^ "blogmacau.info | First swine flu death in Macau". Archived from the original on 2009-09-11. ^ "Gripe A (H1N1): Casos em Portugal mais do que duplicaram na última semana e chegam aos 5123". noticias.sapo.pt. 2009-09-02. Retrieved 2 August 2010. ^ "Deadly H1N1: Sarawakian woman becomes 73rd victim". Malaysiakini. 2009-09-03. Archived from the original on 2009-09-11. ^ "Norway announced 1st confirmed victim of swine flu, a Danish truck driver". metronews.ca. 2009-09-03. Archived from the original on 2009-09-11. ^ "Morbidity and Mortality Weekly Report (MMWR)". Archived from the original on 2009-09-11. ^ "CDC: Any healthy child can get H1N1 flu - UPI.com". Archived from the original on 2009-09-11. ^ "CDC: Older Kids May Have Greater H1N1 Risk". CBS News. 2009-09-03. Retrieved 2 August 2010. ^ "Swine Flu: First death confirmed in Italy". adnkronos.com. 2009-09-04. Retrieved 2 August 2010. ^ "Ecuador's presidential security chief dies of A/H1N1 flu_English_Xinhua". Archived from the original on 2009-09-11. ^ "H5N1: Ecuador: President's security chief dies of H1N1". Archived from the original on 2009-09-11. ^ "Enn fleiri tilburðir av H1N1 staðfestir í seinastuni" (PDF). ^ "Suriname H1N1 flu cases reach 67, with one death". caribbeannetnews.com. 2009-09-08. Archived from the original on August 5, 2010. Retrieved 2 August 2010. ^ "Madagascar announces first swine flu death". iol.co.za. 2009-09-13. Retrieved 2 August 2010. ^ "Penny Arcade - Feeling Sick?". Archived from the original on 2009-09-13. ^ "Slashdot Games Story | Swine Flu Outbreak At PAX". Archived from the original on 2009-09-13. ^ "Confirmed H1N1 cases at PAX | ITworld". Archived from the original on 2009-09-13. ^ "Malawi has 1st swine flu case". oregonlive.com. 2009-09-09. Retrieved 2 August 2010. ^ Thornhill, James (2009-09-11). "Australia reports first Tamiflu-resistant H1N1 case". Reuters. Archived from the original on 2009-09-27. ^ a b Triggle, Nick (2009-09-17). "Fears swine flu 'on the way back'". BBC News. Retrieved 2 August 2010. ^ a b "Nieuwe Influenza A (H1N1)" (PDF). Archived (PDF) from the original on 2009-09-27. ^ "Influenza A(H1N1): Death toll now 77". NST Online. 2009-09-19. Archived from the original on 23 September 2009. Retrieved 2 August 2010. ^ "A/H1N1 Swine Flu (Influenza) Timeline | September 24: Portugal (PT): First death confirmed". Archived from the original on 2009-09-27. Retrieved 2009-09-24. ^ "Schweinegrippe: Erster H1N1-Todesfall ins Gelsenkirchen Deutschland - News - Bild.de". Archived from the original on 2009-09-29. ^ a b Stein, Rob (2009-09-27). "Swine Flu Surge Closes Schools, Tests Hospitals - washingtonpost.com". The Washington Post. Archived from the original on 2009-09-30. ^ "VOA News - H1N1 Swine Flu Keeps Hospitals in Northern Hemisphere Busy". Archived from the original on 2009-10-02. ^ Wong, Fayen (2009-09-30). "Australia rolls out nationwide swine flu vaccination". Reuters. Retrieved 22 October 2010. ^ "UPDATE 1-China's Sinovac gets additional order for H1N1 vaccine". Reuters. 2009-09-30. Retrieved 2 August 2010. ^ "Orders for Live Attenuated Influenza Vaccine". Archived from the original on October 3, 2009. Retrieved October 5, 2009. ^ "Vietnam detects 3 cases of drug-resistant swine flu". Reuters. 2009-10-12. Retrieved 2 August 2010. ^ "Consolidated Status of Influenza A H1N1 - 15th October 2009". PIB Press Release. 2009-10-15. Retrieved 2 August 2010. ^ "UK Swine Flu Cases Rise, Vaccines Available From Next Week - 15th October 2009". Wall Street Journal. 2009-10-15. Archived from the original on 6 January 2010. Retrieved 2 August 2010. ^ "US swine flu vaccines 'delayed'". BBC News. 2009-10-17. Retrieved 2 August 2010. ^ Grady, Denise (2009-10-17). "Officials See a Shortage in Vaccine for Swine Flu". The New York Times. Retrieved 2 August 2010. 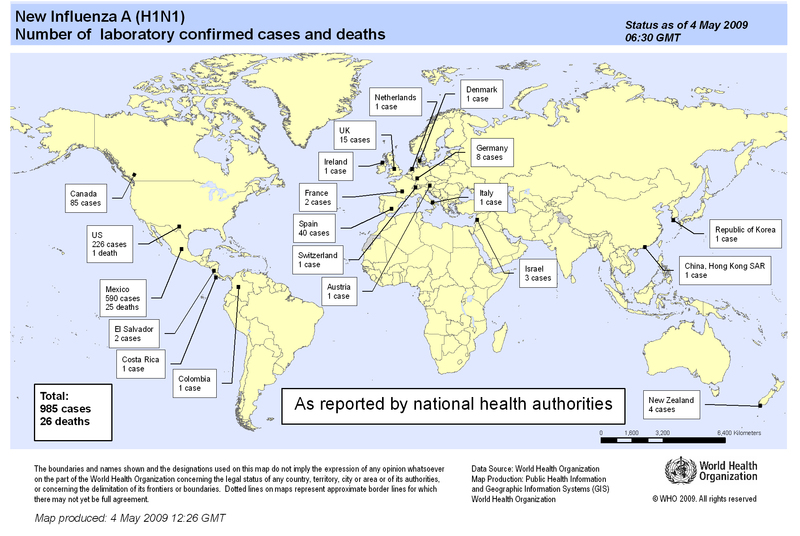 ^ "Consolidated Status of Influenza A H1N1 - 19th October 2009". PIB Press Release. 2009-10-19. Retrieved 2 August 2010. ^ "Ont. turkeys with H1N1 pose 'minimal' risk". CBC News. 2009-10-20. Archived from the original on 22 October 2009. Retrieved 2 August 2010. ^ Triggle, Nick (2009-10-21). "Swine flu vaccination under way". BBC News. Retrieved 2 August 2010. ^ "H1N1 vaccinations rolled out in UK". CNN. 2009-10-21. Retrieved 2 August 2010. ^ Leland, John (2009-10-23). "Fear Over Swine Flu Closes Schools in Iraq". The New York Times. Retrieved 2 August 2010. ^ "Obama declares H1N1 emergency". CNN. 2009-10-26. Retrieved 2 August 2010. ^ "Frustration looms as H1N1 vaccines run out". CNN. 2009-10-26. Retrieved 2 August 2010. ^ Calmes, Jackie (2009-10-25). "H1N1 Widespread in 46 States as Vaccines Lag". The New York Times. Retrieved 2 August 2010. ^ a b c d e f g h i Administrator. "WHO EMRO - Pandemic influenza - Influenza - Health topics" (PDF). www.emro.who.int. ^ "H1N1 vaccine clinics hit by 'pent-up demand'". CBC News. 2009-10-28. Archived from the original on 30 October 2009. Retrieved 2 August 2010. ^ "Swine flu arrives in Turkey: 6 tourists in quarantine". eturbonews.com. 2009-05-17. Retrieved 2 August 2010. ^ Mcneil, Donald G. (April 27, 2009). "Flu Outbreak Raises a Set of Questions". The New York Times. Retrieved 2 August 2010. ^ a b "Son durum: 12 bin 316 vaka, 458 ölüm" (in Turkish). ntvmsnbc. 2009-12-22. Archived from the original on 2013-04-18. Retrieved 2 August 2010. ^ "Afghanistan reports first swine flu death". Archived from the original on October 28, 2009. Retrieved November 2, 2009. ^ "Earth Times: news/293058,belarus-registers-first-swine-flu-death.html". www.earthtimes.org. ^ "First Person Dies of Swine Flu in Slovenia". Slovenian Press Agency. Ljubljana. 3 November 2009. Retrieved 26 March 2016. ^ "USDA finds pandemic H1N1 in Indiana commercial swine". Reuters. 2009-11-02. Retrieved 2 August 2010. ^ "Earth Times: news/294941,tunisia-reports-first-two-swine-flu-deaths--summary.html". www.earthtimes.org. ^ Walsh, Fergus (2009-11-20). "Drug-resistant swine flu hits UK". BBC News. Retrieved 2 August 2010. ^ "Tamiflu-resistant swine flu cluster reported in NC". Archived from the original on November 22, 2009. Retrieved November 22, 2009. ^ "Montserrat reports first H1N1 flu case". 2009-11-24. Retrieved 2 August 2010.